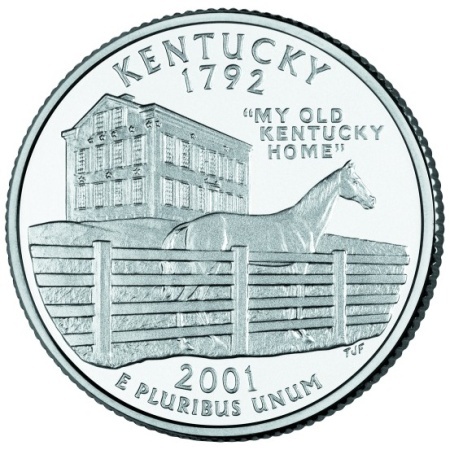 The Kentucky State Quarter was the fifth state quarter issued in 2001 and the 15th in the series which was authorized by the 50 States Commemorative Coin Program Act. The release date for the KY State Quarter was October 15, 2001. The elements of the design include Federal Hill, the stately mansion where Stephen Foster penned the words to "My Old Kentucky Home" which is the state song of Kentucky and also what the now famous mansion is referred to. Other elements of the design include a race horse standing behind a fence. Kentucky is famous for some of the world's finest racehorses which graze the state's bluegrass pastures. Kentucky is also home to the famous Kentucky Derby, which is one of the longest running annual horse races in the country. The Kentucky Quarter Project Committee, responsible for choosing the design of the KY state quarter, was headed by Kentucky's First Lady, Judi Patton. 1,800 designs were received and the Committee narrowed the selections down to twelve which were placed on display in the lobby of the Capitol and on a website. Below is a table showing the design specifications and mintages of the Kentucky State Quarter. Note: The modification moved some of the wording from the reverse to the obverse to leave the reverse available for the state's design. Reverse - Each state theme was proposed, and approved, by the governor of the state. Final design was designed and engraved by T. James Farrell. His initials are just to the right of "E Pluribus Unum". When you see a word underlined in brown, like thisThis is an example of what to expect when you hover over words underlined in brown throughout this site., hover over it with your cursor to see the definition of that word.